The Outstanding Organization - TKMG Inc.
After two decades in the trenches of helping companies design and build better, more efficient operations, Karen Martin has pinpointed why performance improvement programs often fail: chaos, the sneaky but powerful force that frustrates customers, keeps business leaders awake at night, and saps company morale. A powerful model of what makes a high performance organization. This fast-moving book gives managers a series of practical, proven strategies and tools to improve performance to get better results immediately. Brian Tracy, author - Full Engagement! 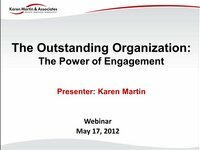 Karen shares her extensive experience assisting companies in their improvement efforts and identifies capabilities common among organizations that have achieved sustainable outstanding success. Why adopting various improvement approaches without building a foundation for success won't solve your problems—and will likely create more chaos. Although you don’t like the chaos that you’re currently coping with, you've probably come to accept it. You don’t have to if you follow the path Karen provides. This no-nonsense book helps you get to the crux of the problem, so you can inject the sensible, disciplined calm that enables the levels of performance and innovation mandated by today's business environment—and help your organization become truly outstanding. The Outstanding Organization reveals why performance improvement programs often fail—and what you can do about it. Take control today! To create a visual reminder about the four conditions you need to establish to become an outstanding organization, we’ve partnered with Successories, the market leader for inspirational products and awards. Clarity, Focus, Discipline and Engagement are available in three poster styles, and in both framed and unframed versions. You can buy them individually or in a set with all four. We hope you enjoy these posters as much as we did in creating them.